The IEAP is a scientific-academic unit of the CTU oriented on the Physics of the Microworld and its applications. The Institute was founded on May 2002 as the experimental unit of the CTU for research namely on particle and nuclear physics. The institute's accounting system is administered separetly under No 35000. Research Center "Material analysis and characterization by radiation"
Research Center "Astroparticle and Astrophysics experiments"
From these programs are derieved a number of projects, both of fundamental and applied character. Activities and experiments are carried out at international research centers to which the Czech Republic is active member. At the instrumental level, the activity of the Institute concentrates on development of detection and spectrometric systems and methods for new technologies and applications such as 2D and 3D high-resolution imaging at the micro and nano scale. 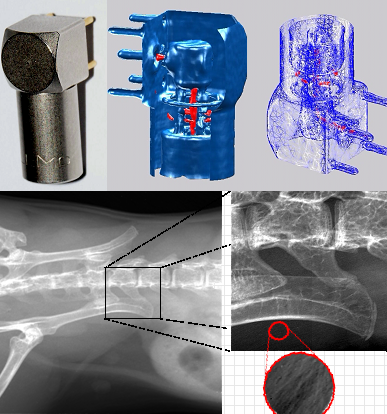 On the figure are shown examples of Imaging in Material and Life Sciences using Thermal Neutrons (top) and X-rays (bottom). Thanks to advanced radiation detectors such as the Pixel detector Medipix it is possible to observe and image small amounts and tiny structures (e.g., 3D micro-tomograph of Lemo connector) as well as soft tissue (e.g., fur of mouse) where sensitivity and contrast enhancement are achieved by the unique properties of the radiation imager (Medipix) in combination with advanced methods of image reconstruction and novel detection principles such as Phase-shift Imaging. Master program "Engineering application of Physics of the Microworld"
Whole life education "Mysteries of the Microworld"
Project CZELTA for students from high schools - the duration 9 years - 7 detection stations in Czech Republic (Prague 1x, Pardubice 2x, Opava 3x, Kladno 1x), in the world 4 stations (Slovakia, England, Romania, France). The purpose of these programs is to stress the Methodological and Physical Principles of the Microworld. For example, for the description of the interaction of light charged particles in matter, the track - 700 micrometer long of a 550 keV electron is shown as detected and vizualized by the position sensitive pixel detector Timepix.